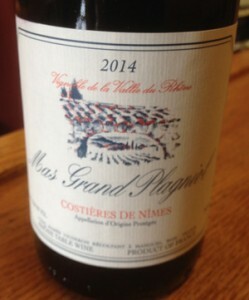 2014 Mas Grand Plagniol, Costieres de Nimes, Rhone Red, France. The 2014 Plagniol Rouge, a fine light to medium bodied effort is a blend of 50% Syrah and 50% Grenache from the old vines around Nimes in the Gard, and while this is typically thought of as in the greater Languedoc, the wines are officially Rhone Appellation d’Orgine Controlee (AOC) and have been since 1986. This is lovely, easy and delightful stuff, the Mas Grand Plagniol Rouge Costieres de Nimes is vibrant, spicy and has just a just of game and earth, but with nice bright dark fruits, it drinks well with almost any food choices and is a go to party or bistro style red. I adore the juicy nature and quaff factor, there’s no pretense and while not overly serious or complex, it does everything well with hints of violets, white pepper, warm stones and garrique to go along with blackberry, boysenberry, plum and strawberry fruits. Ripe tannins and a nice cut of acidity keep this from feeling weighty, and it certainly doesn’t pack an alcoholic punch, this is just a fun Rhone blend to have a few smiles and laughs with, it should take to much thought or ask anything of you. I’ve been a fan and customer of this wine since around 2000, it has always been a great value, and the white blend it also a savvy choice as well, both are no quilt wines that deliver quality and stylish lighthearted drinking, best from 2015 to 2017.